WRC Radical Jumping Rally Set 1/43 scale - Includes everything to go racing! A great layout and offers fun and excitement thanks to the variety of straights, lane change tracks, grade change, and two spectacular loops. WRC Radical Jumping Rally Set 1/43 scale - Includes everything to go racing! 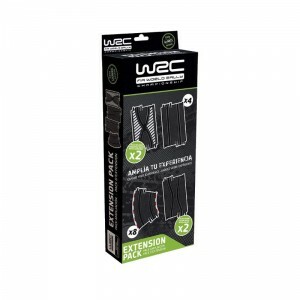 The smaller dimensions of these tracks and cars facilitate the driving and installation of circuits at home, which makes them the ideal springboard for young riders who begin to enjoy the excitement of WRC racing. The controls of the circuit are adapted to the ergonomics of the smallest of the house and also incorporate a TURBO button, which provides a controlled increase in speed in the cars for more fun. WRC Radical Jumping Rally contains 2 cars and presents a great layout that occupies little space, compared to its length, and offers fun and excitement thanks to the variety of straights, lane change tracks, grade change, and two spectacular loops. Players must demonstrate their ability to enter the looping with enough speed and overcome the 360 ​​turn, so they must use the Turbo button of the controls with astuteness. Combine the tracks to make up to 4 different paths!